Perhaps best known these days as the father of leading actress Rosamund Kwan, Kwan Shan was in fact one of Shaw Brothers's top leading man during Hong Kong's sixties golden age of Mandarin cinema. While his fellow Shaw's star Zhao Lei was nicknamed “The Emperor” for his countless roles in costume dramas, Kwan Shan might as well have been called “the prince of the wen-yi” for his dreamy good looks and roles in lavish melodramas (called wen-yi in Chinese). Born in 1929 or 1933 (sources differ) to a Manchu family originating from the northern province of Liaoning, Kwan Pak Wai (Guan Bo Wei) 關伯威, had a difficult early life. When his war refugee parents both died, he was forced to drop out of school in order to become his family's breadwinner, working a variety of menial jobs including as a miner and dock worker. Reportedly, it was upon viewing the ghost movie Beyond the Grave (1954) that Kwan decided to become an actor. Having successfully tested for the studio's Great Wall Movie Enterprise Limited acting course, he was spotted by director Yuen Yeung-on, who cast him in the titular role for his adaptation of Lun Xun's novellaTrue Story Of Ah Q. Shaved and dressed in rags, Kwan Shan was a far cry from the dashing male lead he would later appeared as, but he was already playing a tragic figure which would be his token role for the better part of his career. 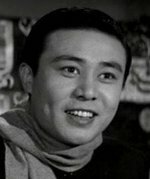 Kwan's performance in The Story Of Ah Q made quite an impression abroad as well, winning him a best actor award at the Locarno Film Festival in 1958. He was the first Hong Kong actor to achieve such recognition in European film circles, launching his career on a most auspicious note. Following his success in Ah Q, Kwan Shan appeared in a dozen movies for the Great Wall and theSun Sun Film Enterprises Ltd.. In 1961, he joined Shaw Brothers, which was quickly rising to the position of top Mandarin film studio in Hong Kong. His first film for Shaw was the wen-yi melodrama Love Without End, opposite the studio's superstar actress Linda Lin Dai. Kwan went on to appear in over twenty Shaw Brothers productions during the next decade, occasionally in cameo and supporting roles, but most often as the male lead. Along with comedian Peter Chen Ho and costume film favouriteZhao Lei, Kwan was one of the studio's premiere leading men. Most of his roles were melodramas with early republican or contemporary settings, and he was often paired with great Shaw divas like Linda Lin Dai,Li Lihua, and Ivy Ling Po. Among his most famous movies were The Vermilion Door, Too Late for Love and Farewell, My Love. Kwan Shan's success was not only due to his handsome face, but also a magnificent pair of sorrowful eyes and an undeniable talent for conveying great anguish. Unfortunately, his propensity toward tragic roles and tearful performances has lead to a somewhat overly simplistic dismissal of Kwan's characters as sentimental weaklings. The truth is that during the Fifties and Sixties, the effete, sensible, vulnerable leading man, chafing under misfortune and fate, was a romantic ideal embraced by the female audiences that constituted the bulk of the viewing public for the melodramas of the time. By the late sixties though, the era for melodrama was passing, and more heroic, manly leading men became more prevalent in Hong Kong cinema, as exemplified by Jimmy Wang Yu and Ti Lung. With his contract with Shaw Brothers finished by 1970, Kwan Shan continued his career in Taiwan over the next 3 years. It was during this time that Kwan tried his hand at producing, directing and even playing a secret agent role forSecret Agent Chang Jiang No.1. His one directorial effort, The Brutal Boxer starring Chan Sing, remains to this day his one solid contribution to the kung-fu genre, aside from a few supporting roles in other films. Back in Hong Kong by 1973, Kwan Shan's days as leading man were now behind him. He was able to settle comfortably into supporting roles for movies and television, mainly playing fatherly figures. By the mid-eighties he slowly faded out of movies, and turned his attention to various other business ventures instead. Modern viewers may recognize him for his bit parts in movies by John Woo (Better Tomorrow II), Jackie Chan Police Story 2) and Sammo Hung (Millionaire's Express). One of his last performances was in a double role for the sci-fi fighting-divas actioner Executioners. Married to Great Wall actress Chang Ping-sie in 1961, Kwan Shan is father to Rosamund Kwan, who began her own movie career in the early eighties. Having migrated to the USA for a period, Kwan Shan returned to HK to be close to his loved ones. He lived out the rest of his life quietly, and passed away from lung cancer in October 2012. Best known these days perhaps as the father of actress Rosamund Kwan, he was a top dramatic leading man in the late 50’s through the 1960s. Back in the 1950's, Kwan was the first actor from HK to win a Best Actor Award at a European Film Festival. After his leading man days were over by the mid 70’s, he continued making sporadic appearances as a supporting actor in some terrific films. Tall and dashing, Kwan Shan was a leading man of the 50s and 60s who sent many women swooning over his good looks and dream lover image. Kwan had an auspicious start to his career with the leading role in The Story Of Ah Q in 1958. Starred in this film made him won the Best Actor Award at the Locarno Film Festival in Switzerland. Kwan was best known for his role in the Doe Ching classic Love Without End opposite Asia’s biggest movie queen, Linda Lin Dai. He would go on to make other hits such as Vermilion Door, Too Late for Love and Farewell My Love. Kwan faded out of the leading man scene in the mid-80s, becoming better known thereafter as the father of actress, Rosamund Kwan Chi-lam.